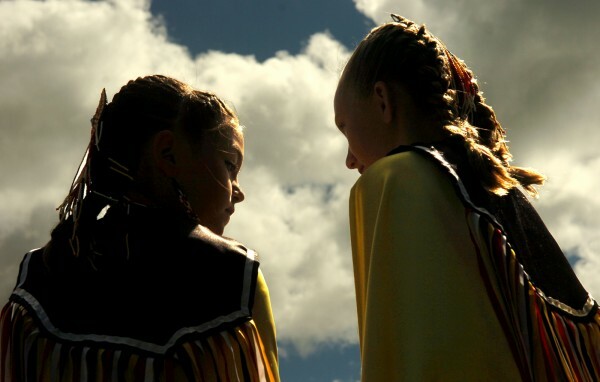 Andrea Kilbirde (left) and Kelsey McDonald, of the Micmac tribe of Prince Edward Island, wait for their turn to dance during the opening ceremonies of the seventh annual North Country Inter-Tribal Pow-Wow, in this 2007 file photo. Non-Native American schools across the nation have long debated whether to keep using American Indian mascots, images and athletic team names. In Langhorne, Pennsylvania, the issue has taken a rather autocratic turn that should serve as a nudge to schools everywhere to abandon racist depictions of Indian nations people. The editorial board for the Playwickian, the student newspaper for Neshaminy High School, has decided it will no longer publish the word “redskins” — its school’s mascot — on its pages. Considering the oppression and forced assimilation of American Indians in both recent and past history, and the fact that the word, at best, presents a harmful stereotype of a diverse culture, and, at worst, is a hateful racial slur, the Playwickian has cause to drop it. It has editorial discretion. But school officials apparently don’t see it that way. In fact, they want to force the student newspaper to use the word. Recently, a Neshaminy School Board committee approved a policy to prohibit the paper from banning it. The school board is expected to vote later this month whether to finalize the policy. The students join the likes of the U.S. Commission on Civil Rights, which has called for the discontinuation of such mascots, the U.S. Senate’s Committee on Indian Affairs and the Maine Indian Tribal-State Commission. Jamie Bissonette Lewey, chair of that commission, speaking before the Maine Human Rights Commission in 2010, described the term “redskins” as being particularly hurtful because it evokes images of bloody scalps and genocide. There is a clear solution to the predicament Neshaminy High School officials have gotten themselves into with the student paper: Change the name of the mascot. But first, set a positive example for Neshaminy High School students by abandoning any attempts at censorship.